P.S. Senior Secondary School, Chennai has advertised in THE HINDU newspaper for recruitment of Teachers PGT / PRT / KGT jobs vacancies. 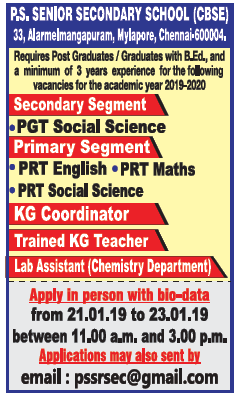 Interested and eligible job aspirants are requested to apply from 21st to 23rd January 2019. Check out further more details below. About School: Located in the heart of the city – Mylapore, the cultural hub of Chennai – our school has been providing quality holistic education at an affordable cost since 1976. We have excellent teachers to support us in our mission. All our principals since 1978 are recipients of the coveted National Award for Teachers from the Ministry of Human Resource Development (MHRD), conferred by the President of India. How to Apply: Interested candidates are requested to send applications with CV, copies of certificates and recent PP size photo to the email address provided below or apply in person. Chennai – 600 004, TN, India.